There has been some hubbub in the cyber world this past fortnight, because of this woman, Maria Kang. The backlash, both from the online community and from people I know, was passionate, angry and sometimes even vile. How dare she shame other women? ‘Fat shaming’ it was called. I watched this discussion unfold (mostly on Facebook and on Mama Mia.com where you can read two takes on the matter here and here) with interest. Most of the response was from mothers and I am not a mother, so I didn’t really join in on the discussion, because I figured I wasn’t ‘qualified’. But then I realised that when I look at the photo of Maria Kang, with her taught body and three small children, I feel like she’s also talking to me. I have no children, I have enough time, I have means, so what’s my excuse? Why don’t I look like that? It’s a good question, Maria. Thank you for asking! And it didn’t make me mad. And I didn’t think she was a shaming cow for posing the question – particularly because I understood that her intention was to, as she explains in her response to the backlash, inspire other women, to let them know that they can benefit from making time for themselves. And on that point, I agree with her 100%. For me, taking time for myself just looks like something else. Then I came across this discussion asking whether or not wearing makeup is deceptive. Good grief! And if you read the negative comments about how beautiful this woman looks in her makeup, they’re from women! Let’s go back a decade when I attended a professional development session (as a teacher) with Michael Carr-Gregg, who is a well-respected child and adolescent psychologist. He asked us to imagine that our life was represented by three baskets: our self, our family (including our significant other), and our friends, colleagues, job, and responsibilities. That third basket is a doozy – there is a lot going on in that third basket. Once we had imagined the baskets, he gave us 30 imaginary eggs to disperse between the baskets. How would we split up the 30 eggs between the three baskets? 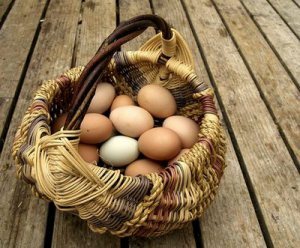 When we came to the results of the experiment, he told us that many women opted to place the smallest amount of eggs in their own basket, and then split the rest between baskets two and three. Typically, however, men don’t. Generally, men will put the most eggs in their own basket and then split the rest between the other two. (Just so you know, I initially put 10 in each basket). Carr-Gregg’s argument was that to be a truly contented and balanced person, one who felt like their needs were being met and who could give to others happily and without resentment or feelings of obligation, we needed to put 15 eggs in our own basket, 10 in the second basket (our spouse/spice and family) and 5 (!) eggs in the third basket. His reasoning was that if we dedicate enough of our time, energy and love to ourselves, by the time we crack those eggs in the third basket, they’re double-yolkers. I loved this. SO much! I have carried this with me for a decade. And those times when I feel strung out, wrung out, and as though my obligations – ones I mostly took on willingly – are piling up over my head, when I resent the people I love the most, when I mindlessly hate strangers who I perceive to be more accomplished, more attractive, or just generally more than me – when my default setting is ‘negative’ and I am quite unpleasant to be around, I do an egg audit. And I usually find that I have been putting too many eggs in the wrong basket.